Tomorrow is my birthday and you know what, it doesn't really bother me. In fact I'll do what I always do on this special day, and that is to take the day off work (RDO not a sickie), kick back at home and enjoy doing what a Dag does best. Nothing. OK, so what's happening in the life of The Dags? The kick off time is almost here. This week I'll announce our first team formation meeting to start planning for the event. Even though it's just under two years away, aspects of the con are already being organised and I'm really hoping for a successful event as it'll be my last one. After languishing in the throes of despair for a number of years, the membership of the club is now starting to pick up. Aside from the upcoming release of the new film in December, I would like to think the new membership pricing structure of $10 has helped which was something I pushed for. 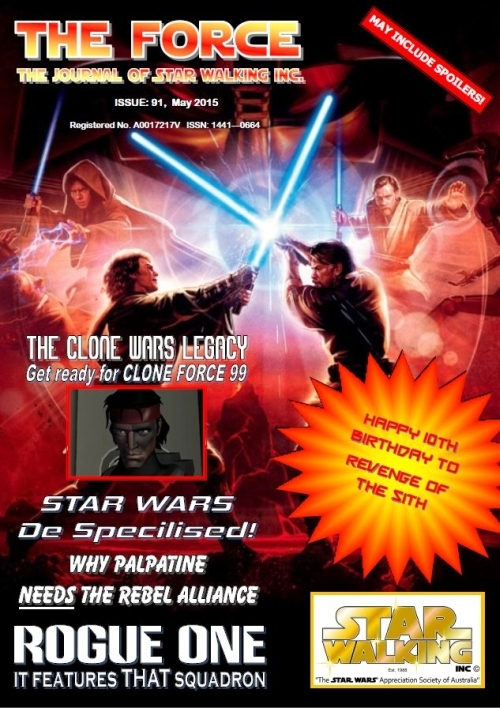 The reason for the cheap price is because for the past two years I've been the editor of The Force newsletter and one of my biggest changes was turning the quarterly paper newsletter into a monthly digital one. It was a pretty radical change, but I'd like to think it's worked well, especially as I've been able to continually produce a new issue each month - below is the cover pic of the May issue to be released this week. The only downside to being the editor is I now have write all of it as the days of members submitting articles have long since past. As an added bonus, Star Walking has announced its Force V Star Wars convention to be held in 2017 (yep the same year as Con 80 and 10 years after the last SWI con). Naturally I've joined the committee for this considering I'm the only person who's helped organise every convention SWI has run - Force V will be #8. So 2017 is going to be a crazy year for me. You may recall Lynne and I were booked for a cruise last year but cancelled it. We're now booked on another one for this year and it's all systems go. The ship leaves on Halloween for the South Pacific islands and we're all paid up and ready to go. Geez it's gonna be great. I tell ya, all I want to do is stand on a clean sandy beach on a Pacific island with palm trees and blue sea water. It'll be my own Gilligan's Island moment. Gimme that and I'll be happy, the rest of the trip is just a bonus. For the most part I really can't complain, though I'm still unable to kick the chocolate habit (you can thank Lynne working for Cadbury for this LOL) which doesn't help my weight plus I don't do enough cardio exercise which is my biggest failing. On the plus side my non soft drink life is going well (been a couple of years now without touching a drop), I also eat multi-grain bread instead of white bread, and I have two pieces of fruit per day. On top of this is Lynne's wonderful cooking which is something I always enjoy. So in all I FEEL pretty good despite being slightly heavy and I guess something must be working 'cause a guy at work thought my birthday tomorrow was for me turning 42 not 48. As you know I finished my Starforce section and I'm now working on my Austrek history, wow what a BIG job that's turning out to be! It certainly doesn't help that I'm the longest serving active member of the club - yep I'm STILL attending Austrek meetings after 30 years. So this equates to a LOT of memories. The good news is I have at least made a start on it and though the entries from the 80s are longer than the late 90s or 2000s, I'm still doing what I can to cover off every piece of detail. It'll be a slow grind but a worthwhile one for sure.